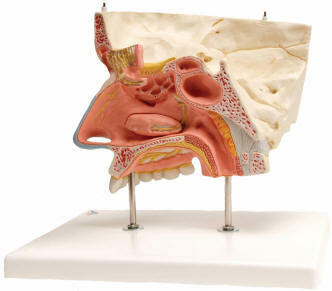 This nose model illustrates the structure of the nose with the paranasal sinuses in the upper right half of a face in 1.5-fold enlargement. The following structures can be seen from the outside of the nose with paranasal sinuses, differentiated by color (also visible through the removable transparent skin): the outer nasal cartilages, the nasal cavity, maxillary, frontal and ethmoid sinuses; and the opened maxillary sinus when the zygomatic arch is removed. This is a great teaching tool, with detailed anatomy. 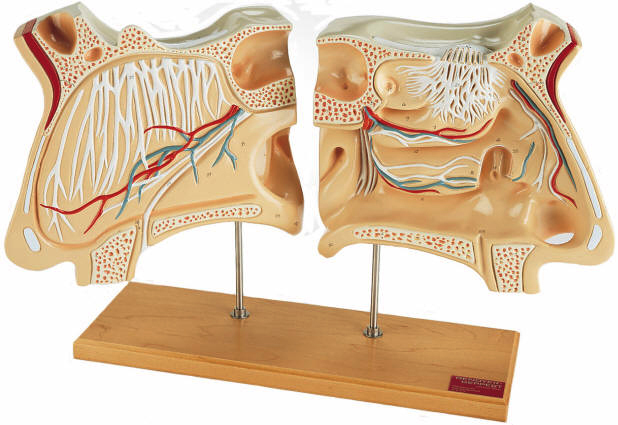 Two unbreakable plastic models on one hardwood base depict the nose and nasal passages enlarged 4 times their normal size. 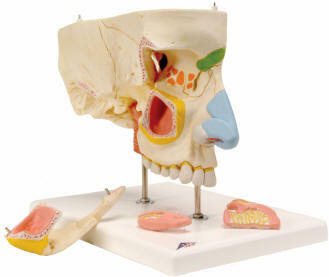 The model on the right shows the nasal septum, its arteries and veins, the inner group of olfactory nerve filaments, nasopalatine nerve, soft and hard palate, uvula and the cranial floor. The model on the left depicts the left nostril, olfactory nerve bulb and filaments, sphenopalatine ganglion, communicating sinuses, arteries and veins, the pharyngeal orifice of the Eustachian tube and the nasal conchae. The turbinate bone and nasolacrimal canal are also presented. 12 numbered features are identified in the accompanying key. Overall dimensions 18 x 4 x 14 inches.